OK, no excuses people. Time to get outside and get the butterfly garden going. It’s not hard. Doesn’t take all that much time. And every day it inspires. For proof, check out the slideshow below. Turf to bed conversion: why wait? The photos below reflect 12 months in the life of a butterfly garden. 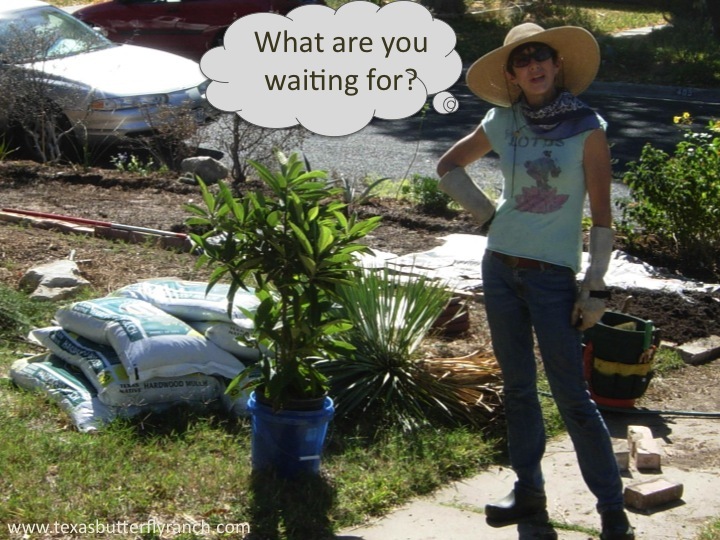 On November 17, 2010, I converted the Bermuda grass infested front yard of my Austin apartment into a productive, fun and fascinating butterfly garden and edible landscape. A year later, I’m leaving it behind and moving back to San Antonio to begin another yard transformation. For help getting started, check out Part I and Part II of our Turf to Bed Conversion Series. All the drought-damaged lawns around Austin and San Antonio beg to be converted from turf to beds. Fair warning: a butterfly garden has the occasional dose of drama. Consider the case of my Heirloom Tomato Thief. In June, someone stole the perfectly robust, ripe heirloom tomatoes I had incorporated into my butterfly landscape. I only had two tomato plants, so this was especially aggravating. Each day I passed these plants en route to work via the walkway from my apartment to the car, and was clocking their optimal harvest time. Just as they reached their prime, a thief snatched the purply red tomatoes from their destiny as a Caprese salad. Then someone chopped down my remaining six-foot tall sunflower a day later. These garden violations drove me to borrow a digital game camera and bungee-cord it to a tree, where it snapped photos every five minutes for two days. The backside of the alleged tomato robber was captured by “the Gardencam”–but she wasn’t. Take a look. Nothing conclusive, but I felt a bit better and the thievery stopped. Butterfly gardens can make productive use of even a small plot. In my limited space, I raised dozens of caterpillars and butterflies, grew handfuls of fruits and vegetables, and burned calories, worked on my tan, and made new friends as neighbors walked by commenting and asking questions. What’s stopping you? Your butterfly garden is waiting. Make it happen. Let us know if you have questions, and good luck! Like what you’re reading? Don’t miss a single post from the Texas Butterfly Ranch. Sign up for email delivery in the right navigation bar on this page, like us on Facebook, or follow us on Twitter, @butterfly beat. They all come here for the summer. What can I do to welcome them? And would you like me to send them back in the fall with heirloom tomato seeds? Check out Katherines’s blog at http://atthemanse.wordpress.com Pure poetry. Saw your article in the Native Plant Society of Texas Newsletter. Native plants, butterfly homes, low water use. beauty….What more could anyone want. Keep up the great work. Thank you for the kind words and for stopping by! Nice hat, for sure. Thanks, Lisa. Will have to research Vegas butterfly gardening and get back to you. Thanks for stopping by. Great articles, information and pictures! I am a beginner and learning about butterfly gardening and new to texas as well. Alot to learn, and this is helpful. It is a challenge to find some of the plants though in San Antonio, maybe I am not looking in the right areas? Keep up the good work –love the articles and transformation! Yes, some times it’s tough to find the plants at the right time–milkweed is especially hard to locate this time of year. That’s why I like to take the plants with me when I relocate. One of my favorite San Antonio nurseries is Fanick’s on Holmgren Rd. Check it out. Thanks for the kind words, and keep us posted of your progress.